EUR has been supported by the economic reports in Eurozone and today Spanish 10-y Bond Auction and Philadelphia Fed Manufacturing Index can bring some volatility to the market. The support rests at 1.17830 with resistance at 1.18230 which the weekly pivot point at 1.18050 is located in between the lines. The EMA of 10 is moving with bullish bias in the descendant channel and it is below the EMA of 200 and above the EMA of 100. The RSI is moving on the 50 level, the Stochastic is showing upward momentum and the MACD indicator is in negative territory. The ADX is showing weak buy signals. 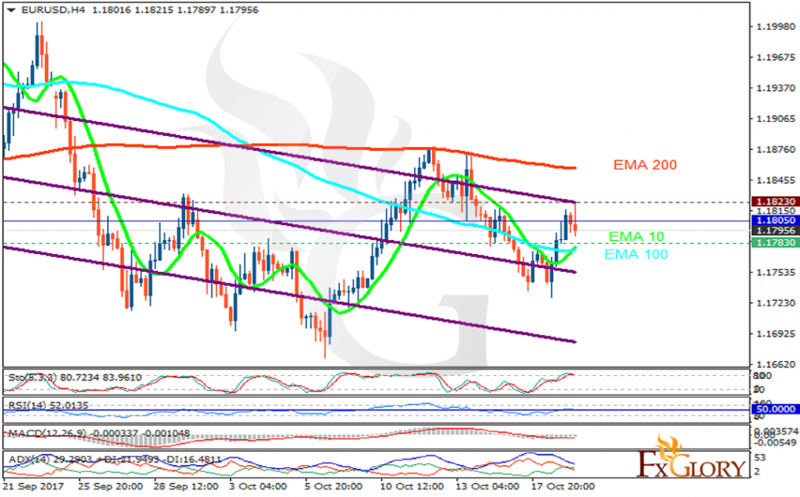 The indicators are not presenting any specific direction however the support level breakthrough can pull the price down towards 1.15 area, otherwise EURUSD will rise towards 1.20.